My medical school follows a very typical 4 year plan. The first 2 years are preclinical, with the majority of learning taking place in the classroom with lectures and one longitudinal clinical experience, where we’re paired with a physician mentor and attend their clinic with them for half a day each week. The third year of medical school is entirely clinical, where we have to rotate through a series of mandatory clerkships (Surgery, OB/GYN, Anesthesia, Psychiatry, Family Medicine, Pediatrics, and Internal Medicine). Our fourth and final year of med school is to take several rigorous “Acting Internships/Sub-Internships”, where we’re treated like first year residents in the fields we are interested in pursuing. 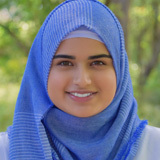 I was on my OB/GYN rotation when I wrote this post, specifically my two weeks of Gynecology, which is a surgical service known as ‘Gyn Surg’ at my school. A surgical service tends to be fast paced and extremely busy, requiring long hours on our part, but full of excitement and adventure! Here’s what an average day in my life looks like during this time. I combined pics from the course of a week because this actual day was so busy, I couldn’t get as many as I needed! 4:30 a.m.: Wake up cursing my decision to go to med school. Every morning. Turn off the selected alarms I have for the day (usually set at random times) and snooze just one so I don’t end up sleeping through AM rounds. 4:48 a.m.: Try again and eventually make it out of bed. I have a pretty busy and varied day today so I focus on looking presentable/professional. I make sure I have all my stuff; coffee and greek yogurt included. Grab my bags and head out the door. 6:15-6:25 a.m.: Drive to school and walk to team room. I live super close to our medical school and hospital campus, the Milwaukee Regional Medical Center. 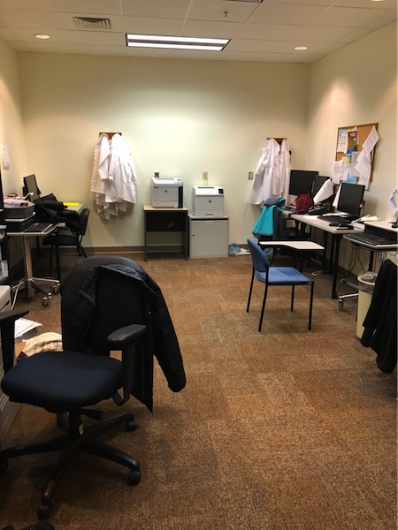 We can get placed all over the Southeastern Wisconsin region for rotations (my next 2 rotations are around 25-30 mins away from where I live), so I’m thankful for my short commute that lets me “sleep in.” It’s a bit of a walk from the student parking lot to our team rounding room. 6:30-6:45 a.m.: One of my patients from yesterday stayed overnight in the hospital. I have to check on her (interview and physical exam) and write a progress note on her by our 6:45 am morning rounds. She’s a super pleasant lady, but I always feel bad about having to wake up patients for a post-op exam first thing in the morning. At least it’s not my surgery rotation, where I’d be waking up patients around 5:20 am to prepare for rounds at 5:45 am! I go through my series of post-op questions, inquiring about her pain and progress since her surgery. I then listen to her heart and lungs, perform a short abdominal exam (inspect her incision sites, auscultate, and palpate light touch and deep touch), and review her leg edema. I then head back to our team room to write a progress note in the patient’s chart on Epic. 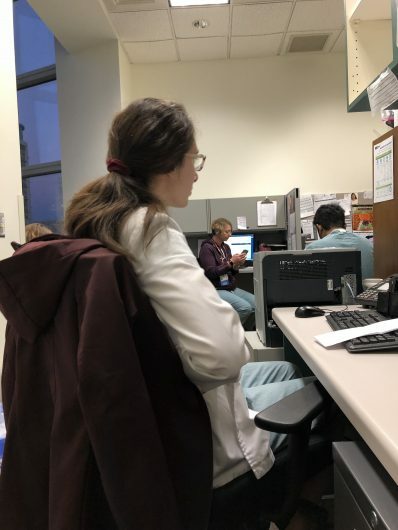 6:45-7:15 a.m.: AM Rounds Each medical student updates our residents (1 upper level resident (PGY-IV) and 1 lower level resident (PGY-II)) about their patient. This is called ‘presenting’ the patient. There is a very standardized format to do this, depending highly on what service/rotation you are on. The presentation format allows us to systematically discuss our patient’s care, making sure that important issues are highlighted and no area is missed. Sometimes, we present directly to the attending physicians. While I definitely get nervous during my presentations, it’s something that we continue to work on throughout M3 and M4 year, and even early into our residencies. Then, the residents will update our attending physician with what the day’s plan is. This is what our rounds looks like from my vantage point today. 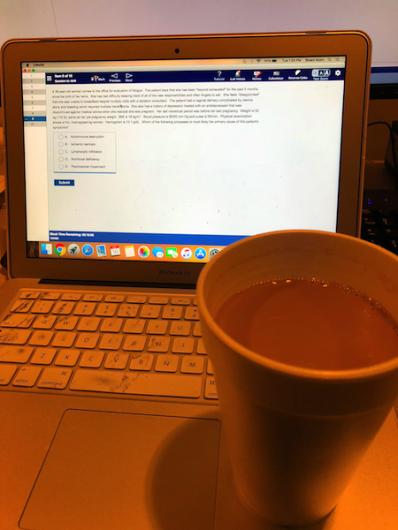 The night before clinic, I always prep all of my patients by reading their charts in Epic and making sure I’m aware of why they are coming to clinic today and if there is any relevant testing they need done. Since clinic moves so fast between patients, there’s not enough time to learn about a patient for the first time one minute before you’re supposed to go meet them. With a heavy practice, this can take anywhere from one to two hours for me. My clinic mentor is seeing around 15 patients today, which isn’t out of the ordinary for his super busy practice. My role is to see patients before him, interview them and determine what information is relevant. If they are in their second and third trimesters of pregnancy, I use a tape measure to determine their fundal height (from pubic bone to the top of their uterus), and use a Doppler to listen to their fetus’ heartbeat. The fetal heart tones are my favorite part of the visit, as I get to figure out where baby is inside mom, and it’s fun to see babies move away from the stimulus. Then, I present the patient to my attending, and we go in to the room together for the rest of the visit. As a student, I’m allowed to perform any physical exam maneuvers that the patient is comfortable with me doing. At a teaching hospital, faculty really make it known that med students are here to learn by doing, not just observing. No breaks between patients — clinic is always an intense experience but I love getting able to chat with the patients. Side note: if I can get away with it, I prefer going sans white coat. This is why I’m not wearing my coat in the picture from clinic, in case you were wondering. It’s great for holding all my gear in the pockets (pens, pen light, stethoscope, notebook, cell phone, and all the dressing supplies on surgery), but it can definitely be a barrier from helping the patient feel relaxed, especially since they are sharing their story with not just their doctor but also the student. 1 p.m. Oops we are 1 hour behind! I admire my clinic mentor’s refusal to skimp on conversations with patients just because he is running behind. Each patient deserves the full amount of time allotted to them. 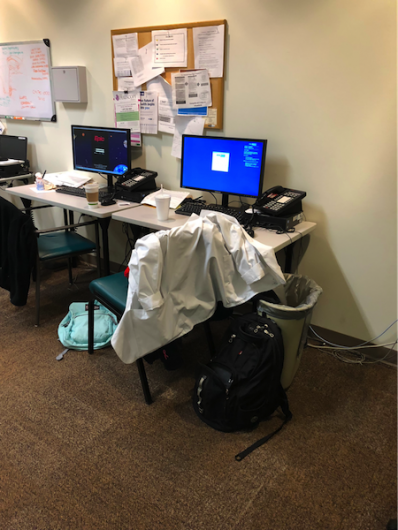 After clinic, I run to the locker room to change into my scrubs and stuff my face with a turkey sandwich at my desk (the one with the white coat over the chair) in the Gyn team room. It’s time to head to the OR! 1:30-3:30 p.m. Surgery A patient I saw with my clinic mentor earlier in my rotation was found to have a rare tumor known as a teratoma. It’s a tumor made up of germ cells (the cells that make up gametocytes) that is made up of different types of tissue, typically hair and sebum! They can also have muscle and bone cells in them. I was waiting for this case for weeks because it interested me so much. It’s one of those topics you learn in med school that you never think you’ll have the chance to see! The surgery to remove the tumor (known as a dermoid cyst given its size) was done laparoscopically, and I was straight up mesmerized the whole time; it was definitely one of the coolest surgeries I’ve seen so far. Laparoscopic procedures are fantastic because the student gets the best seat in the house, close to the screen that is showing the camera’s viewpoint into the pelvic cavity. My job in these cases is to insert the foley catheter to empty the bladder, insert the speculum to visualize the cervix, and then place and use the uterine manipulator tool inside the uterus. We manipulate the uterus to keep it out of the way for the surgeons, helping them avoid any potential perforations. Especially when dealing with a tumor that holds caustic contents, clear visualization is a MUST. After the case, I got to sew up some of the laparoscopic port sites in the patient’s abdomen, which is always a thrill for me. 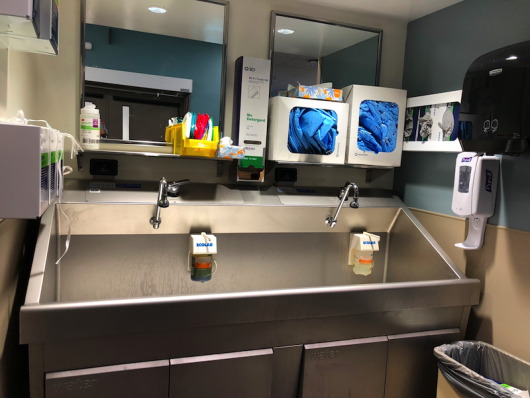 We can’t really take pictures inside the OR so here’s a picture of one of our scrub sinks, complete with shoe covers and eye protection. I don’t know about other med students, but for me, scrubbing and then walking into the OR getting ready to get gowned and gloved will never get old. It’s the anticipation, the excitement of the wonder I’m about to witness and be privileged to participate in. 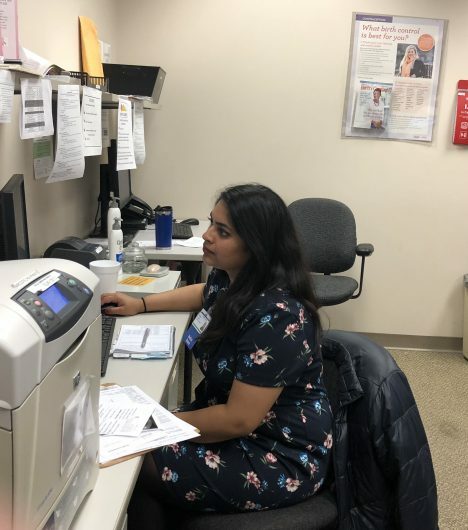 4-5 p.m. Study If there’s any time at the end of the day when we are not helping residents with their afternoon continuity clinics or heading to the ED to see consults paged to us, I try to do some practice questions if I can. For each rotation, we take a comprehensive exam at the end that helps us work toward the completion of our degree. These are known colloquially as ‘shelf’ exams. I was actually dealing with a bit of a migraine today, so hence the extra coffee. I also have my Anki flashcard app and the UWorld question app on my phone so I can study in any 5 minute downtime period I may have. Since third year of medical school isn’t like college or the first two years of med school, where you have structured lecture time and time off to study, we have to find time when we can. 6:30-8:30 pm: Study It’s getting close to my OB/GYN shelf, which is also the same day as our Anesthesiology exam (the rotations are combined at my school). I try to work on some practice questions and review some of the mandatory homework assignments we are assigned. Doing a little bit of work every day is the only way to stay on top of rotations. It’s so hard to focus on studying when you’re exhausted from a long day, but it’s really important. 9-10:30 pm: Done for the day I pack up my things and get everything ready for tomorrow. While this gives the impression that I am organized and tidy, don’t mistake me; I just want the extra time in the morning to sleep! After some pudding for dessert, it’s time to brush my teeth and call it a day. I like to watch a little more Netflix or YouTube in bed before setting my alarm for tomorrow and calling it a night. Time to do it all over again tomorrow! My major is Molecular and Cellular Biology (more commonly and lovingly known as MCB) in the College of Liberal Arts and Sciences. 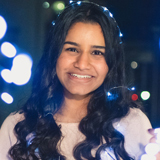 I'm on the pre-med track—I’ve dreamed of becoming a doctor since I could spell the word! I had fun reading your account of the day. I’m still in high school but I’m thinking about medical or vet school and I find this information very encouraging. It sounds like you have fun, even though it’s hard work. Thank you for this insight. 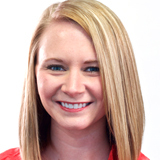 From I-STAR to Illinois Graduate…hear some of their stories!